In my book, the ultimate upcycle is when you can literally make something out of trash. Like when I trash picked these green chile cans after making a pot of soup. Yep, I grabbed them right out of the recycle bin and turned them into glittered tin can tea light holders for my table. This isn’t the first time I’ve upcycled a tin can into something pretty and useful. You might remember when I made this painted metal flower with various sizes of tin cans. Yep, trash to treasured artwork on my wall. So let’s get to the quick and easy instructions so you too can make glittered tin can tea light holders for your table. As a true hoarder crafter, I tend to save things for a future project. Anyone else do that? If you said no, I don’t believe you. Even though this dictionary was missing pages I kept it and hoped we never had to look up anything that started with the letter E. Also, does anyone use a dictionary these days? If you said yes, I don’t believe you. Back to the glittered tin cans. I shouldn’t have to say this because it’s common sense but thoroughly wash and dry the cans. I’m a lazy crafter but not that lazy. 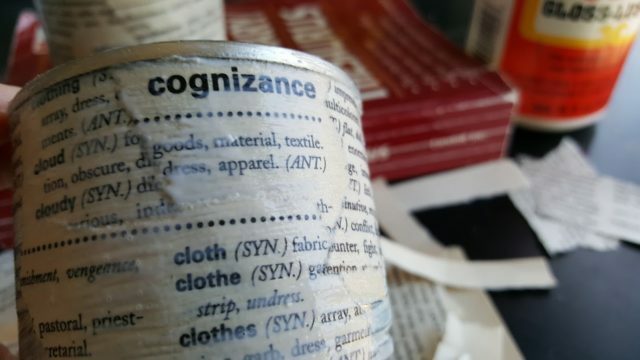 Tear the dictionary pages into strips to wrap around your can. I like the jagged edges but if you are a perfectionist feel fee to measure and cut your page strips. 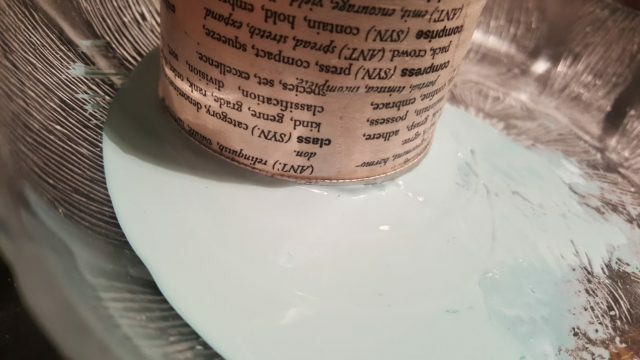 Attention crafters, Mod Podge is your friend, it could be your best friend if you wanted to take it to that level. So make sure you have it in your craft stash. Oh and there is more than one type of Mod Podge. You’re welcome. With a brush, add a layer of Mod Podge around the can and add a layer of book page strips. Continue adding more paper layers until your can is completely covered. To seal the pages and a top coat of Mod Podge. Now reach back into your childhood and your love of chunky glitter because adults tend to hate it due to the mess. Let it go here and embrace the chunky glitter for this project. 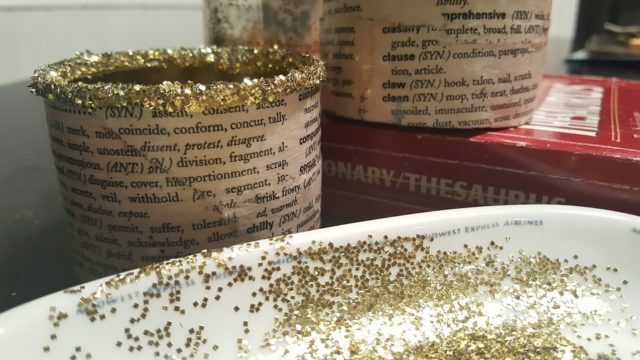 I dipped the edge of the can into some leftover homemade chalk paint and then dipped it into the chunky glitter. Honestly, any glitter would work but I just happened to have the chunky stuff leftover from my book page wreath. Honestly, chunky glitter will make you smile, a lot. Just do it! 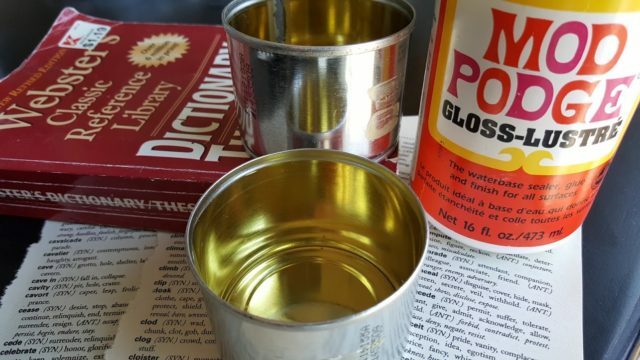 A bonus with these green chile cans is that they are gold on the inside so there was no need to paint them however, you could always add that step to your project. 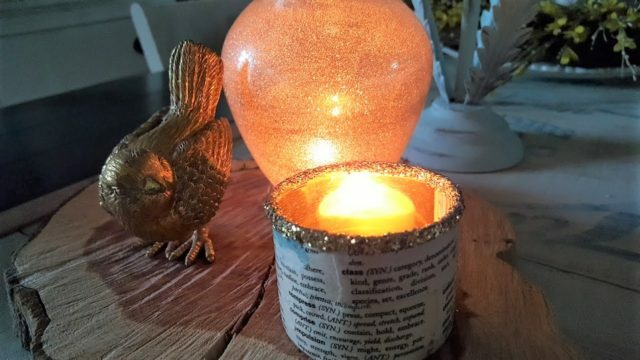 Get creative with your trashy glittered tin can tea light holders. That’s it on this quick and easy DIY project. I have added my votive holders to my table decor and scattered them around my house as a fun vignette accent.